The Complete Maui Experience! Book through us and receive complimentary discounts to restaurants and activities such as Duke's, Hula Grill, Kimo's, snorkel gear, Whale Watching, Snorkel excursions and tons more!! The Mahana Resort - If you are familiar with West Maui, you will already know The Mahana is truly a premier property with spectacular oceanfront views. Just steps to the sandy Kaanapali beach, you will be led on a two and one half mile stretch of incredible ocean beauty. This AAA 3-Diamond resort consists of twin towers containing 215 units on 5 acres. Designed with a sense of peace and privacy, you are close to championship golf courses, great restaurants and shopping. This unit is a 7th floor one bedroom unit with a king-size bed, one bath and the living room has a queen sofa bed. The unit serves four guests very comfortably. The kitchen is fully equipped including refrigerator with ice maker, stove, dishwasher, microwave, toaster, drip coffee maker, blender and all kitchen utensils. Also included for your convenience is salt and pepper, spice rack, plastic wrap, foil, baggies, napkins, paper towels, toilet paper, Kleenex, dish soap, hand soap, dishwasher soap, laundry detergent, shampoo, conditioner and hair blow dryer. All linens are provided including extra bedding and towels. Also available for your use are beach towels and a cooler. The unit has two flat screen televisions with remotes, one in the living room with aDVD player and one in the bedroom. A stereo is provided in the living room with CD player and docking station. Central air conditioning, washer/dryer, iron and ironing board and extra hangers all make your stay more relaxing. The tiled lanai is spacious with patio table and four chairs. The unit is approximately 1056-sq. ft. and the interior is decorated in Hawaiian motif. Hawaii State Sales Taxes are additional. Maid Service available at additional cost. Don't like the $500.00 refundable damage deposit? We offer our own damage liability form, just inquire! An important feature to think about when considering Maui Beach Condos is the owners, Ben and Evie Leland, live on Island and are there to assist you should you need anything, or if there is any concern regarding your accommodations. Many owners who rent, live on the mainland which can potentially create problems if there is a need for assistance. **If your dates are not available for this unit, please email or call me for a referral! ** We also have units 114 and 815 at the Mahana, vrbo #'s 193906 and 195811 available!!!! Ben & Evie Leland live on island, retired and enjoy giving back to their community. They are proud owners of 3 condos at The Mahana and a Kaanapali Vacation Home. They were both in construction for over 30 years, have 5 children and 13 grandchildren. One of their daughters, Alicia with Visit Maui Beach, is their booking agent while Ben manages the properties. Alicia lives in Seattle Washington and has 5 children. We love our small family run business, our properties are amazing, very well kept and we offer over the top customer service. Our unit 717 is gorgeous and literally steps from the beach! You cannot find another condo as close to the beach as this one! The owners live on island and close by should you need anything and/or if something in the unit needs attending too. We love what we do and offer excellent customer service! Our reviews speak volumes! We look forward to having you join our family. Mahalo! The condo was great! Absolutely beautiful, unobstructed views from both the living room and bedroom. Go to sleep every night with the sounds of the ocean. Very well equipped. Everything one would need and all in great shape. Great location. The only negative is that the beach in front of the condo is not very wide or really swimmable. Great communication with the property manager and deposit was refunded in a timely manner. We would absolutely return. We had a wonderful stay in Unit 717 at the Mahana. It was clean and well maintained and Alicia kept checking with us to see if we needed anything. The location and view from the condo are the best. Alicia is so easy to work with and responds immediately to any questions. We will be back. Our second stay in Mahana 717 was as good as the first. The ocean view is still spectacular, and the unit is still clean and well appointed. Added to the whale watching this year (both from the room and the beach) were sightings of a couple of seals and a pod of dolphins. The new window blinds are a great upgrade. They are see-through, but still provide heat protection from the afternoon sun. We could enjoy the view from the floor to ceiling windows while we took a mid-afternoon break from being on the beach. Looking forward to coming back next year - hoping our schedule works out. The Condo was fully stocked with everything you could want or need for a vacation home. The view is spectacular (bring your binoculars), we were able to catch some great surfing and even whale watching right from our deck. Second time renting from Maui Beach Condos. Alicia is easy to work with, always available to quickly answer all questions. Kitchen is well stocked with pots, pans, dishes, glasses and spices. Beach chairs, towels and small cooler are a nice touch. Had breakfast on the Lanai every morning, while looking at the ocean and listening to the waves. You can walk onto the Lanai from both the living room or bedroom. 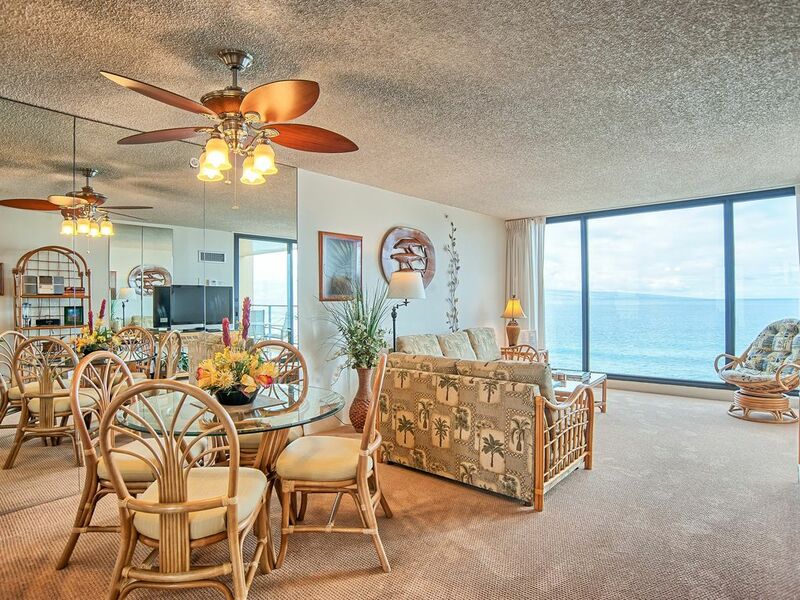 Would definitely rent from Maui Beach Condos again! We had the best time! The condo is great and you can't beat the view! It was well equipped with everything we would need. The location is awesome with the boardwalk, close to the grocery store and restaurants. We will definitely book this unit again! Can't wait to get back. Thank you! !